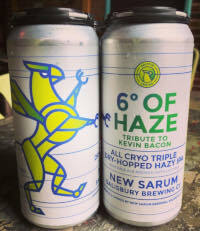 New Sarum Brewing has been busy coming up with some great brews. The latest if part of the Griffin Series and is a hazy IPA. The brewery is out of this beer, but we have plenty on our shelves. Available in 16 ounce singles or 4-packs. Stop in and get some while you can. Once it's gone, it's gone.